Since we’re coming up on the solar tour this weekend, I wanted to post the numbers for July through September. We turned net positive in August and now have a surplus of 851 kWh. Last year at this time we had a surplus of 1,749 kWh. Looks like we’re in fairly good shape to generate more than we use this year, unless we have more cold snaps. We’ve already had our first frost in September. Last year we turned the heat on October 27. Can’t wait to see what the next quarter holds for us. 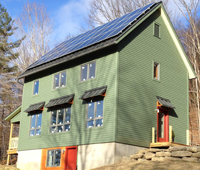 Happy October and go see some homes on the solar tour this weekend!